The Supreme Court on Friday upheld the High Court judgment that ab-initio barred the APC from conducting its ward, local government, and state congresses in Rivers State, pending the determination of a suit that was filed by 22 aggrieved chieftains of the party. The aggrieved party members had on May 11, 2018 secured an interim injunction from a High Court in Port Harcourt, which restrained the APC from going ahead with the indirect primaries that held on May 19, 20 and 21 respectively which produced Mr Tonye Cole as governorship candidate and other candidates to represent the party in the 2019 general elections. The APC had, through its lawyer, Prince Lateef Fagbemi, begged the Supreme Court to clear legal impediments against its list of candidates that contained Cole’s name. 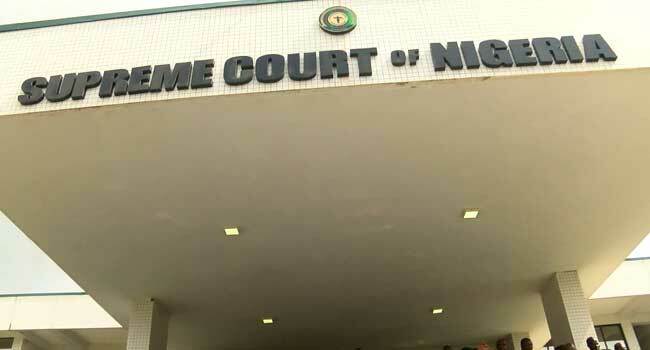 A five-man panel of Justices led by Justice Mohammad Dattijo, however, rejected the request with a unanimous verdict, which rather re-affirmed the Supreme Court’s previous ruling that validated the high court order that barred APC from conducting primaries in Rivers. The Supreme evoked Section 22 of its Act which allows it to take over a matter and give final judgment to decide on the appeal. In a lead judgment delivered by Justice Sidi Barge the Apex Court held that by virtue of Section 11 Rule 5 of the Appeal Court Rules. The appeal against the High Court ruling having been withdrawn by the APC is tantamount to outright dismissal. Justice Barge said that since the court of appeal failed or evaded to make dismissal pronouncement for the said appeal, the Apex Court has no choice than to evoke section 22 of the Supreme Court act to assume jurisdiction over the case and decide on it. He said, “It is my considered opinion that this appeal must be given a decent burial. The appeal having been withdrawn at the lower court by the respondent is deemed distilled. This is what the lower court failed or evaded to do. “Therefore, by virtue of Section 22 of the Supreme Court act 2004, the lower court having failed to exercise its powers provided under Order 11 Rule 5, this court is bound to do so. “Thus, I will allow, the appeal and set aside the ruling of the lower court dated October 31st, 2018. I hereby dismiss Appeal No Ca/Ph/198/2018. Same having been validly withdrawn. The Ojukaye Flag-Amachree’s led APC had appealed the ruling of Justice Chiwendu Nwogu, which nullified the APC state congresses and the nomination of Mr Tonye Cole as the party’s governorship flag bearer in the forthcoming general elections. Justice Chiwendu Nwogu of A High Court sitting in Port Harcourt in Rivers State granted an interlocutory order on May 11t, 2018, restraining the APC from conducting any local government area congresses in the state. Your comments MUST BE constructive with vivid and clear suggestion relating to the post. Your comments MUST NOT be less than 5 words. Do NOT in any way copy/duplicate or transmit another members comment and paste to earn. Members who indulge themselves copying and duplicating comments, their earnings would be wiped out totally as a warning and Account deactivated if the user continue the act again. Rant Money does not pay for exclamatory comments Such as hahaha, nice one, wow, congrats, lmao, lol, etc are strictly forbidden and disallowed. Kindly adhere to this rule. Let Gabzy Media setup your blog and get free traffic for the first three months! Fact Check: Are sellers actually using sniper to preserve beans?